I actively hate the term self-care. I realize this is unpopular. For a long time, I viewed the concept as a justification to abandon discipline and follow impulse. I thought of self-care as the act of conceding something, of doing something unproductive or indulgent you would not otherwise do in response to some modicum of progress. I’ve always thought everyone is capable of much more than they realize, and constantly stopping to reward yourself or relax keeps you from staying hungry for success or growth. These ideologies started to clash with my reality. In winter of 2018, I was diagnosed with mental illness. Then, in the summer of 2018, I did the previously unthinkable; I decided to take a year-long leave of absence from college. The mission: figure out how to live with the illness that brought so much negativity in my life and somehow find enough stability to return to academics. What everyone told me: engage in self-care. Cue the frustration. For most people, thoughts of self-care conjure up the vision of bath bombs and chocolate-covered fruits. 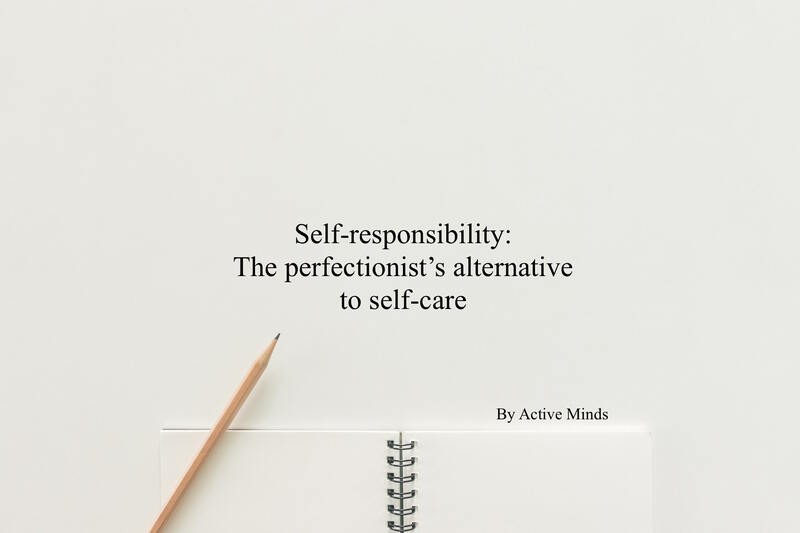 But just like the platitudes I posited about self-care for so long were oversimplified, I have found the popular manifestations of self-care are to be as well. Enter self-responsibility. My own version of self-care. While it is critical to not overdo things in the short term to keep yourself going, you can decide to set aside the lavish and engage in small steps toward long-term growth. Each day, I work on things that I know will build my confidence and help me work toward that ideal person that I envision myself to be in the future. I do this outside of work and school commitments. Even only 1–2 hours a day that might otherwise be spent on pampering easily becomes 300+ hours of skill mastery after only one school year. The beauty of this is that you have complete ownership of what you dedicate yourself to. After you choose where you’re headed, you can then write down your goals and focus on the process of getting there. I like to include the worst-case scenario, as motivation can be more clear when you know what you are trying to avoid rather than what success might ultimately look like. Let me give an example. My version of self-responsibility manifests itself in planning out and executing a Powerlifting program. To the outsider, this seems like hard work. But to me, planning what weights I’ll lift in an Excel sheet and going to actually do it three days a week is a form of self-love. I enjoy the feeling of lifting heavy things, and even in the moments of pain, I know that I am improving my health, strength and body composition in the long term. Because I make my body sore, I am then compelled to eat and sleep properly in response. I know this action is going to produce a future Paul that is more confident and has a more stable mood. Another example: journaling each night. There are many nights that I am exhausted and would much rather fall asleep than write down my thoughts. But more often than not, I do it anyway, because this helps me practice mindfulness in a way that will stick with me. If I can reflect on my thoughts and learn how to separate the neurological junk from the useful thoughts, it will serve me each day in immeasurable ways — from job interviews to raising a family. Many would consider these things to be work, but they are ways that I claim responsibility for myself my future and my own form of self-love. There is nothing wrong with treating yourself, indulging in a controlled way and celebrating your wins. By focusing on self-responsibility as opposed to self-care, I make a choice each day to work toward a future for myself where I don’t need a daily or weekly respite from my life. That respite will come in the quiet confidence each time I see my reflection, or the peace I feel going to sleep knowing I worked hard at work worth doing. Authors for this piece are Paul Charbonneau and the Active Minds e-board, a chapter of the organization at Occidental College. Active Minds is a national organization that aims to reduce the stigma surrounding illness and promote good mental health.